This chocolate mask is a sumptuous addition to any self-care routine. Mineral clays gently exfoliate and draw excess oil from the pores, while milk powder and ground oats keep skin firm and hydrated. 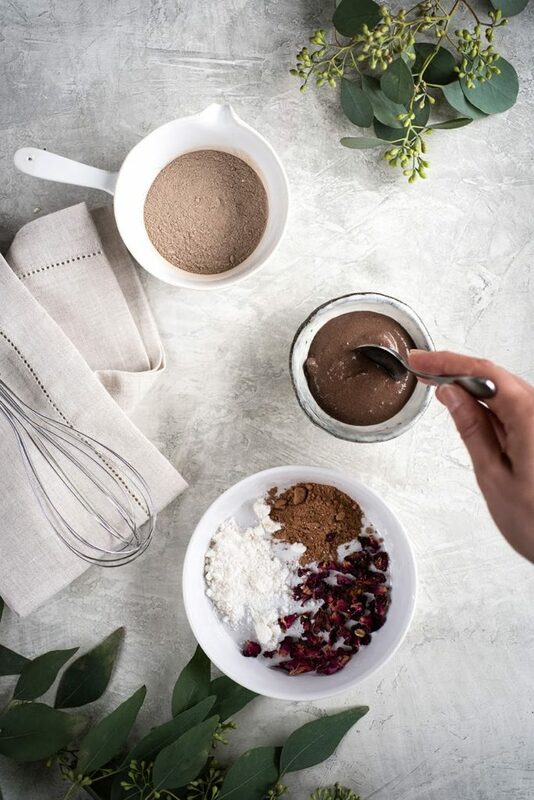 With the addition of chocolate, resist the temptation to eat—this recipe is best applied to face, neck, and décolleté. Whisk all ingredients in a medium sized bowl. Spoon into jar, cap, and label. Combine approximately 1 tbsp. of the mask powder with approximately 2 tbsp. water (or see below for variation). In a small bowl, mix well into a paste. Add more liquid to reach desired consistency. Apply mask to a clean, steamed face. Gently apply onto face - if more exfoliation is preferred, use a soft circular motion (be mindful not to scrub which can strip the skin and disrupt sebaceous production). Leave mask on for 3-15 minutes. Unless skin is extremely oily, it is best to keep the mask hydrated while on the skin by adding a few drops of water, misting rosewater, or gently applying a warm, damp cloth. Follow up with serum and / or moisturizer.